Nepenthes reinwardtiana is an evergreen, climbing shrub, producing stems up to 10 metres long and scrambling over other plants for support. 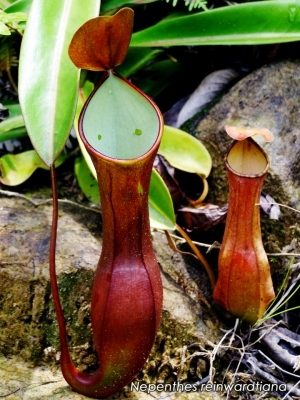 An insectivorous plant, producing pitcher-like traps at the ends of its leaves into which insects fall and are digested in the fluid at the bottom of the pitcher. The plant stems are gathered from the wild and used locally for making rope.